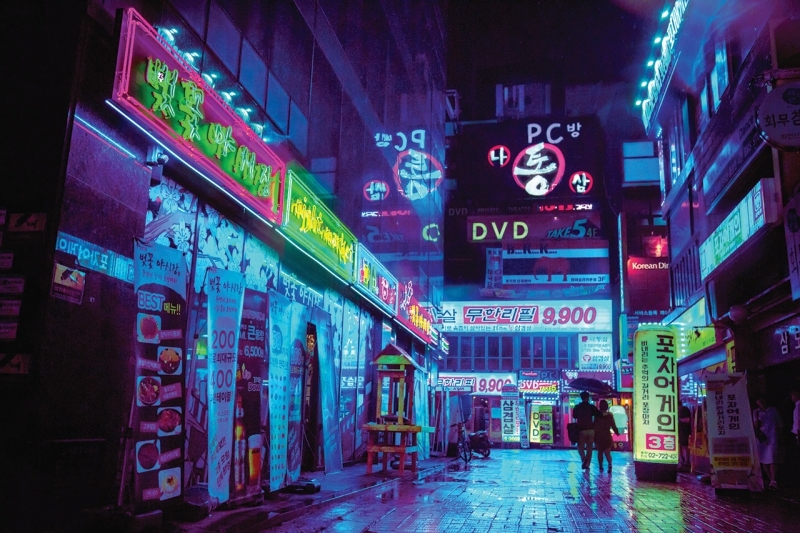 Seoul has always been a night city in my eyes. There are shopping centers that are open 24 hours a day, people heading out for drinks with coworkers, families out enjoying dinner at their favorite restaurants, and there are lights everywhere. Night is the best time to see the city at its liveliest, but also at its most beautiful. It’s easy to get lost in the crowd of people, especially in the streets of Seoul, but sometimes you just need to step back and find a nice rooftop bar with a view like this one in the middle of Jongro. There you can watch people go about their evening, having a laugh with friends, commuting to the next bar, or simply hanging outside a convenience store having a drink with friends. The jumbled and crowded stores with criss-crossing cables may not be appealing to most people’s eyes, but it is part of the city and is beautiful in its own way. Sometimes while walking down these old alleys, you come across beautiful views that you will not find in more polished areas. 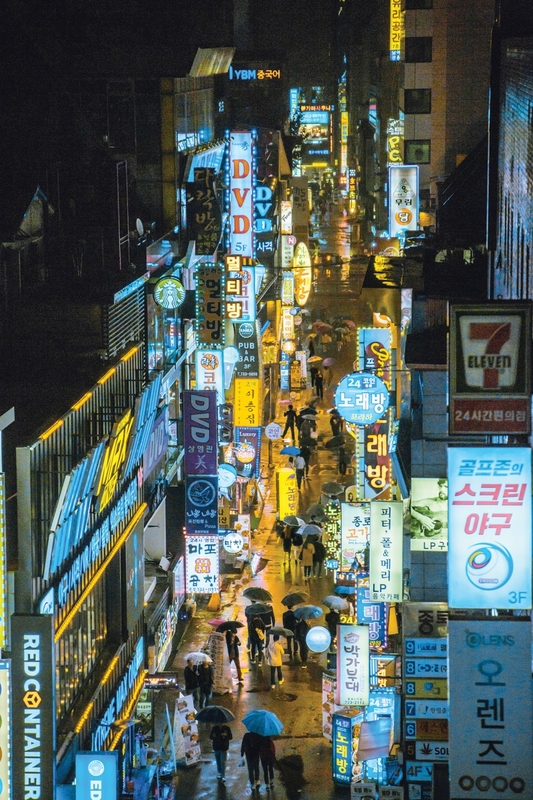 Seoul is a busy city with Jongro being the epicentre of activity during the evening. 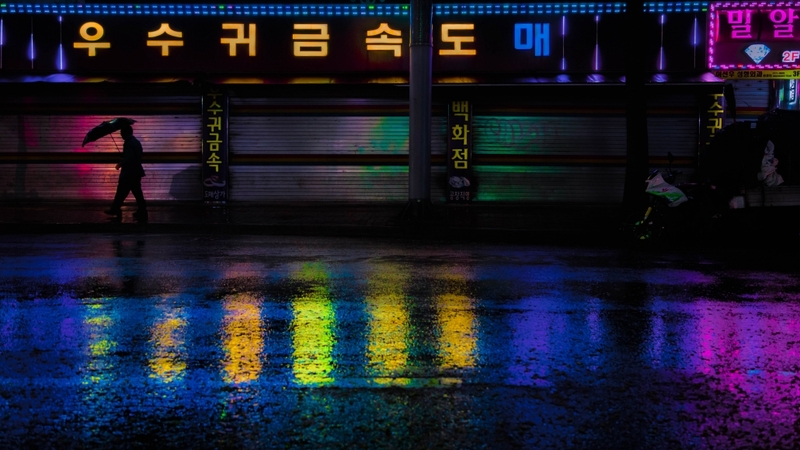 Jongro is one of the areas I enjoy shooting due to all the neon and LED lights all around. There are many people who head there after work for dinner or a drink with friends. Despite there being so many people, it’s not difficult to find intimate moments like this: a couple walking home after a night of socializing. 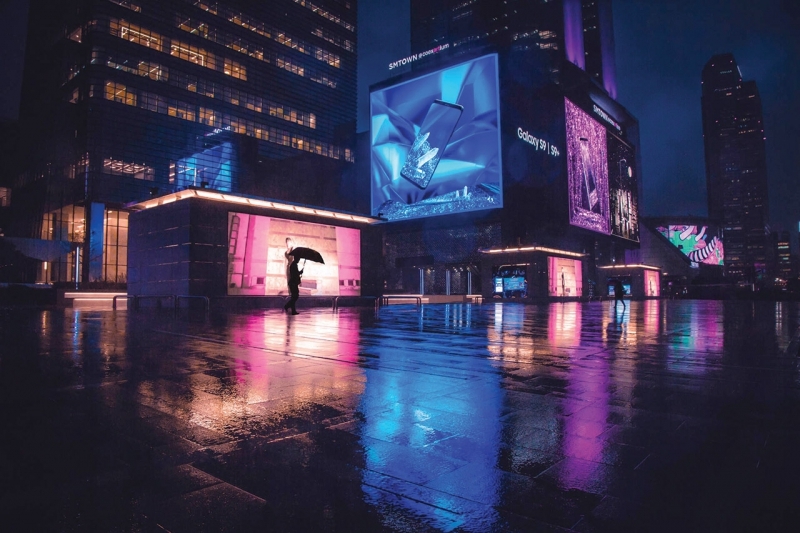 Gangnam has become synonymous with Seoul thanks to the hit song “Gangnam Style.” The Coex is located right outside Samseong Station, and its glitz and glamour are hard to miss. SM town, the cultural hub of SM Entertainment, is located directly behind it, so once people are done shopping, they hope to catch a glance of their famous K-pop artists. When most people think of Dongdaemun, they think of the newly built spaceship-looking building. But Dongdaemun is actually an extremely large area that also caters to the locals. There was a man walking. Lured by the hof hosts, he took a look and decided it was the place for him. 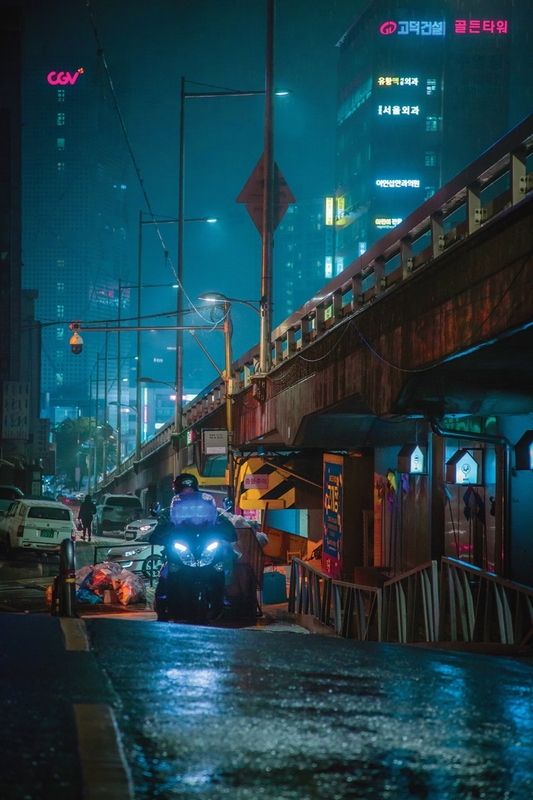 Motorcycle delivery is a staple of Seoul life. Restaurants have their own deliveryman or may be associated with a food delivery system allowing Seoulites to order anything they would like. In this shot, I came across this incredibly lit motorcycle delivery man. 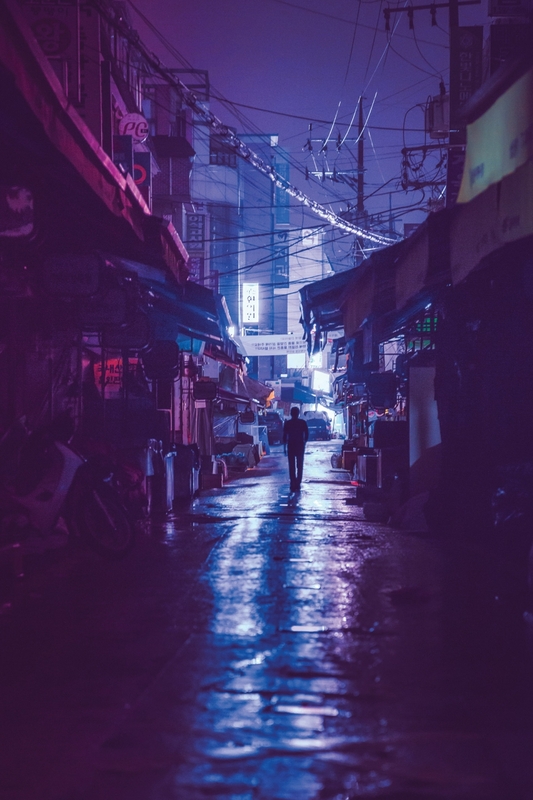 It seems almost cinematic on this rainy evening. 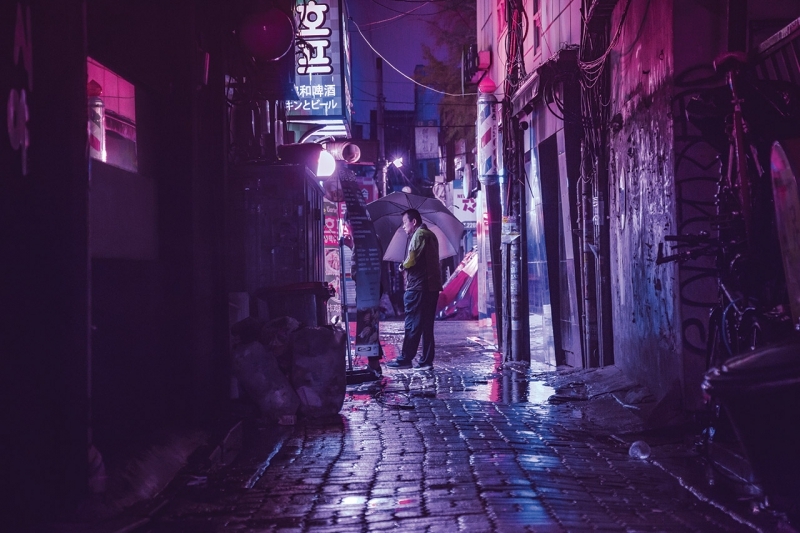 Just a short walk outside of Jongro exit 5 you will come across the maze of alleys surrounding Gwangjang Market. It is much less sleek and dark than the neighboring areas. 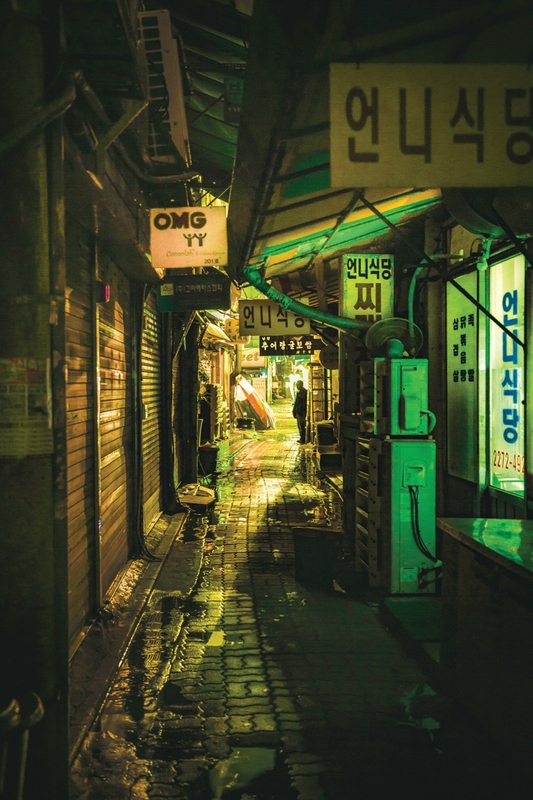 The alleys are quintessentially Korean and something you find less and less as new areas are developed. Getting lost in these pathways is something most tourists never experience, but they should.